Caviar is launching a pre-sale on November 28th, 2017, with the goal of raising $25 million. pioneering a dual-purpose token and crowdfunding platform built on the Ethereum Blockchain that will offer access to stable real estate and cryptocurrencies, with built-in downside protection and automatic diversification. The team behind Caviar has successfully managed a multi-million-dollar real estate debt fund since 2013, and brings years of experience and research to this project. Caviar is powered by Intelligent Predictive Model (IPM), an artificial intelligence algorithm, allowing for stronger predictive power and more effective asset allocation. 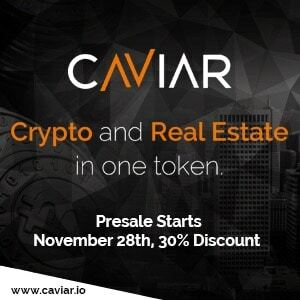 In addition, Caviar Platform will allow real estate developers to raise funds for their upcoming projects, and for Caviar token holders to earn additional rewards by staking their tokens. Global real estate equate to over 60% of all mainstream assets, and are worth over $217 trillion dollars. In comparison, the total cryptocurrency market capitalization recently hit a new all-time high when it surpassed $175 billion. “Considering these factors, the potential financial benefits of a real estate backed cryptocurrency are massive,” comments Caviar partner Guy Neumann. In the past several years, cryptocurrencies have been outperforming most other asset classes. However, diversification within this asset class is problematic. There is high correlation to Bitcoin and to other cryptocurrencies. This new asset class is also highly volatile, illiquid and often not backed by anything tangible. By combining crypto assets and real estate, Caviar aims to offer a higher rate of return than traditional real estate investments, while maximizing downside protection. In addition, Caviar will provide traditional investors with the financial benefits of a more diversified portfolio that includes digital currencies. Although cryptocurrency traders can profit from the volatility of the market, they are offered little in the way of real assets. Caviar provides a unique opportunity for crypto-investors to diversify their portfolio through exposure to real estate. Caviar’s tokenization approach to investments in real estate, cryptocurrencies and crypto-assets lowers the cost of management, reduces entry costs for investors, and removes the problem of illiquidity associated with traditional real estate investments. Caviar has developed their Intelligent Predictive Model (IPM), an artificial intelligence predictive algorithm based on a machine learning approach for price forecasting in both short and long-term projection timescales, allowing for stronger predictive power and more effective asset allocation. IPM uses historical data and a mixture of qualitative/quantitative metrics, in combination with analysis of the underlying cryptocurrency ecosystem, social signals, and trends. Data is automatically collected from various sources to make judgments in real time. Caviar is launching a pre-sale on November 28th with the goal of raising $25 million. Here is some information about the upcoming token sale.